Shelby Snake logo's on a blue 100% cotton t-shirt. 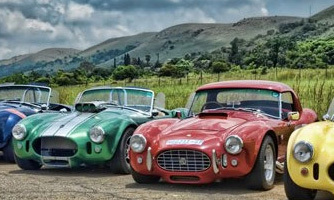 1965 AC Cobra Replica - "Assembly Required", A tribute to all builders who took the challenge to assemble their biggest “model” of all. Follow the instructions and although a bit more complicated, just as much fun! The plastic “tree” is full back screen-printed and a smaller, “I built it!” is also featured on the left chest. Shelby Snake logo on a blue 100% cotton t-shirt.